These dampers are designed to help dampen torsional crankshaft vibrations and will help with the longevity of your race motor. These are mainly beneficial to engines built to rev past the recommended rev limit. 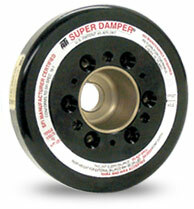 Factory OEM dampers are two piece units and are prone to "splitting" apart. In addition, OEM dampers are hardly efficient past 8000 rpms. For those looking to make power with these units, look elsewhere as these dampers were not designed nor intended for this. In fact, you may LOSE some Horsepower due to the larger overall diamter and increased weight over the factory unit. However, think of this a small insurance on that fully built $5K plus engine. The main difference in cost for this damper vs. competitors (fluidampr) is the fact that ATI builds a custom hub and timing gear to better transfer the vibration into the damper. This is a much improved design over just bolting on a damper to the stock timing gear. ATI’s 7” and 6.325” race versions are built with all-out power in mind. built into the hub with laser engraved 360° timing marks on outer damper shell. Want this item shipped out today, April 23? Order within the next 12 hrs 38 mins.